Working toward legislation to curb light pollution in Illinois. Light is light. Or at least, that tends to be our instinctive reaction; either we have enough light to see what we're doing, or we don't. But in studying how we actually visually perceive things, we find that several qualities of light create large variables; in particular, the color composition of the illumination we have can make a considerable difference in how well we see. And when we start to look at how manmade light interacts with the rest of our environment, we find even greater variations, based on the spectral properties of the light created by the various light sources we use. To achieve the most effective outdoor illumination, and to minimize harmful side effects from that lighting, we need to have a good understanding of the nature of light, the effects of various types of light, and the light sources we use. Additionally, with the advent of a whole new generation of lighting -- the LED -- it is all the more important that we not only consider light quality, but use good information to guide the development and implementation of this new technology. In this paper, we hope to illustrate some of the basic concepts involved in understanding light color, and lay out the current understanding of color-related effects. Many of these issues have not been researched enough for us to have an absolute understanding of mechanisms and effects. But there is strong scientific evidence that most, if not all effects of light aren't just a matter of whether it is light or dark; the spectral qualities of light are actually the determining factors. 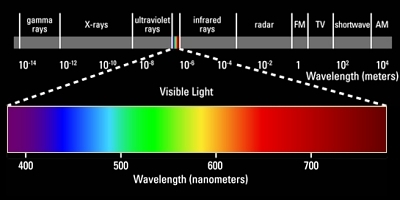 Light which is visible to our human eyes represents just a tiny percentage of the full spectrum of electromagnetic radiation-- just a few of the many wavelengths which photons of light come in. From the insects which see in ultraviolet wavelengths, to the reptiles which hunt in infrared, many organisms see the world in different light than we do. And, within our visible spectrum, light color effects vary greatly, too; one example being how stem elongation in plants is regulated by blue light, while flowering period is triggered by red-orange light. 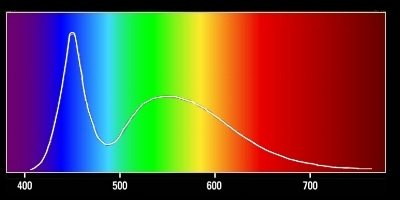 We will use this illustration of the spectrum of the light visible to the human eye to take a closer look at some of the issues surrounding the color of artificial light. When we divide out the spectrum of light from our Sun, or other hot bodies (like the filament of an incandescent lamp), we see a "rainbow" of continuous colors, from red to purple. Incandescent objects emit light in a broad spectrum (including heavily in the infrared); the hotter they are, the more blue light is included in their output. But many of our modern light sources are not incandescent; they create light by exciting atoms in other ways. 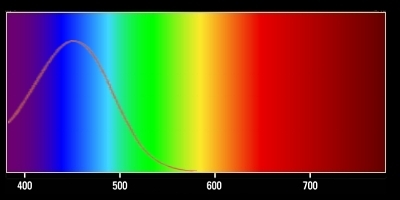 The spectrum to the left is from a ceramic metal halide lamp1. Instead of a continuous spectrum, this lamp emits light only at a set of specific wavelengths. 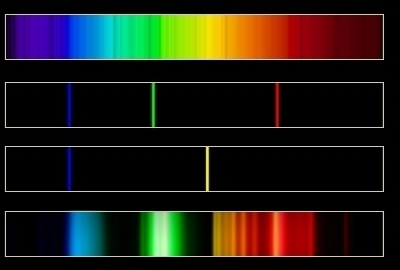 Judging the actual amount of light emitted at any particular range of wavelengths is difficult from looking at a photo of the spectrum itself (top); to do this accurately, we need to plot the actual energy intensity of each wavelength in a spectral energy distribution graph (shown under the spectrum). 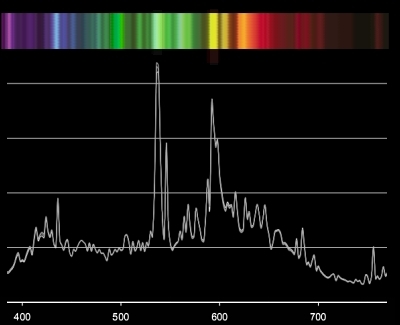 Instead of just showing brighter and dimmer lines, the graph in essence tells how much radiant energy is being emitted in each spectral wavelength (spread out horizontally, just as in the spectrum). It isn't necessarily the highest spike on the graph that "wins"; the area under the graph line is what counts. If the area under the line in the yellow portion of the spectrum is twice that of under the blue portion, the source is emitting twice as much yellow light as blue. From this data, we can see what percentage of light energy is being emitted in any chosen range, for instance, the range of sensitivity of a particular retinal cone cell (see below). The human eye features three different light detecting cells which function in higher (daytime) lighting levels. Each of these "cone" cells is sensitive to a different range of wavelengths; by combining their signals together, our visual system perceives color. On this graph the sensitivity curves of the short ("blue"), medium ("green") and long ("red") cone cells are shown2. 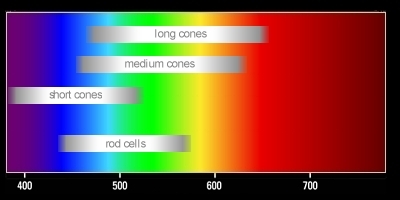 Interestingly, while a color vision system based on cone cells occurs across a wide variety of vertebrates, there is a notable variety amongst animals in both number of types of cones present and their spectral responses, and of balance between daytime cone cells and night-vision rod cells (see below). Hence, the human eye is not a good tool for judging the detailed spectral characteristics of a light source. This especially comes into play when trying to use the Correlated Color Temperature (CCT) to judge the complex effects (visual, ecological, etc.) of complex spectra. CCT is entirely based on human perception, characterizing a complex spectrum (such as metal halide or fluorescent) as a smooth-spectrum incandescent (blackbody)3 with the same perceived color balance. A spectral energy distribution (often termed Spectral Power Distribution, or SPD) analysis is needed (rather than CCT) to see "inside" the light coming from many artificial sources, when studying the effects which different wavelengths of light have on vision and the environment. In low light levels, the sensitivity of the retinal cone cells tapers off, and the rod cells take over. There is only one type of rod cell, so the vision it provides is monochromatic; by moonlight, we see only in "black and white". This chart shows the spectral sensitivity range of each of the cone cells which together provide "photopic" (daytime) vision, and the more sensitive rod cells which provide our "scotopic" (nighttime) vision4. In moderate light levels, such as at dusk outdoors or under many artificial light conditions, both the rod and the cone cells contribute to human visual perception. The spectral response of the human visual system under such circumstances is complex and only partly understood. In general, though, this "mesopic" (twilight) vision has a spectral sensitivity peak intermediate between that of photopic and scotopic vision, the shape of this response is affected very strongly by not only the amount of light available, but also by the visual task -- what it is you're seeing and reacting to. As an example, at a given lighting level, the effect of the light source spectral distribution on the ability to read a sign is likely to be much different than the effect on your ability to detect a deer at the side of the road. Much more research is needed to increase our understanding of vision at the intermediate lighting levels relevant to outdoor lighting. The human eye, in daylight (photopic) conditions, achieves its peak sensitivity in the yellow-green range, at around 555 nanometers wavelength (with all three cone cell types working together). Peak scotopic sensitivity (nighttime vision) is around 510 nm, in the blue-green; the mesopic peak floats somewhere between the day and night peaks (in the greens), depending on the lighting level, the portion of the eye's field of view involved, and the visual task. It makes sense to consider these peaks when providing artificial light, so we can provide the best visual acuity while using the least energy to produce light. But, there is more to color and visual perception than light sensitivity alone. Research shows that the amount of perceived discomfort glare from a light source, especially at night, is strongly dependant on the color composition of the light. In the graph on to the left, the black lines show the level of reported discomfort experienced by observers viewing light sources of the same intensity, but at different wavelengths5. The line with the solid dots is the data from younger research subjects (in their 20s); the line with the open circles represent older subjects (in their 60s and 70s). We see a significant increase in perception of glare with a change in light color, especially toward the blue end of the spectrum. Other research indicates that a prime source for the perception of glare comes from the short-wavelength responding cone cells; in this research, the highest ratings for discomfort coincide directly with the sensitivity curve for those cells6. We have added that color response curve to the same graph, borrowing it from the human vision in daylight chart, above. This color-related aspect of glare has been witnessed by anyone who has been annoyed by the oncoming headlights of vehicles equipped with the new blue-rich high-intensity discharge lamps. The lens of the eye actually fluoresces -- glows -- when exposed to light. 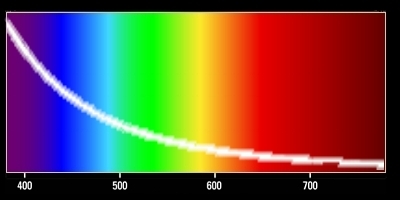 This graph shows how the amount of fluorescence is directly related to the wavelength of light entering the eye7. This effect becomes more pronounced as the eye ages8, and can affect visual acuity in both high and low light levels. It likely adds to the perception of glare at night, making those blue-tinted headlights even more disruptive for older drivers than younger ones. 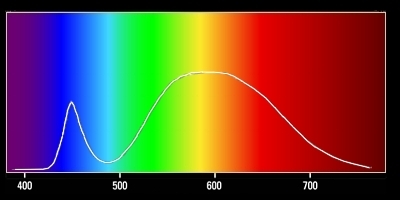 The dilation and constriction of the iris has been shown to be regulated primarily by exposure to blue light; the photopigment melanopsin (see below) is thought to play a key role. In lower light conditions, we need the pupils of our eyes open as widely as possible for the highest visual sensitivity, but the use of artificially blue-heavy light, even at lower intensities, may cause undesirable pupillary constriction. It has been well established that the circadian rhythm in our bodies plays a critical role in maintaining our health9. Disrupting this internal clock leads to increased occurrence of a long list of physiological ills, from disrupted sleep, to depression, to obesity and even some forms of cancer. It has also been shown that the light/dark cycle of day and night sets our internal clock, and that exposure to light during what should be the dark period of night keeps the circadian systems within the body from being correctly synchronized. The light detector for this clock-setting function is a material called melanopsin; it is located in non-visual cells (not the rods or cones) in the retina of the eye. Melanopsin is triggered by short wavelength visible light; this chart shows the curve of wavelengths which have been effective in reducing the production of melatonin (a product of a healthy circadian rhythm) in humans10. Photons of shorter wavelengths carry more energy. Because of this, blue and ultraviolet light to create much more "wear and tear" damage to the cells in the retina of the eye than moderate or long wavelengths, leading to vision loss11. Children's eyes are particularly susceptible to the phototoxic effects of shortwave light. We are only beginning to research the effects which both natural and manmade light have on the natural world. Some things may seem obvious, such as that green plants need light, and some animals are diurnal and others nocturnal, but the roles which light and the day/night and seasonal cycles play in the lives of many organisms are poorly understood. It is obvious, from what research has been done, that light isn't just light in any part of biology; spectral quality plays a key role in every system studied so far. Since its discovery just over a decade ago, melanopsin has been found in numerous organisms; it seems to be a very ancient light sensing compound, and may well play a role in the regulation of circadian rhythms of many other living things, even as simple as algae. All such organisms will tend, therefore, to have their melanopsin-related photodetection disrupted more (if not only) by blue light. Visually perceived light also greatly affects other organisms; for instance, many insects are drawn out of their ecosystem niches to die instead around outdoor lights, while many bat species are in population declines around populated areas, and have been shown to avoid artificial light. In some beach areas in Florida, new lighting has been installed to reverse the problem which earlier lighting created, of causing sea turtle hatchlings to head inland rather than down to the ocean. But new, more yellow-balanced lights, which are less disruptive to the turtles, turned out to be more disruptive to the native, nocturnal beach mice12. The "light pollution" which lights up the sky throughout the night over most populated areas today is very spectrally dependant. The daytime sky is blue entirely because as sunlight shines through our atmosphere, most of the colors of its "rainbow" pass on through, but some of the blue wavelengths are scattered by molecules in the air. The same effect occurs at night; the redder wavelengths of light shining up from artificial sources on the ground tend to pass on out into space, while the bluer wavelengths are more prone to scattering, and shining back down into our eyes, making the sky gray rather than black. We can see the spectral bias of this scattering in Earth's atmosphere in this graph to the left; very little scattering occurs on the red end of the spectrum, but the rate is high on the blue end. When the air is hazy with dust or smog, the strength of this effect is decreased, but not eliminated. In addition, the visibility of sky glow from blue-rich light sources on the ground is dramatically increased because this blue light, preferentially scattered in the atmosphere, is also the light that the eye is most sensitive to when it is adapted to dark conditions (as discussed above). Spectral issues are of key concern with any artificial light source. But light-emitting diodes (LEDs) deserve a focused look, partly because of how they create light, but also because of the increased role which they are expected to play in the future of both indoor and outdoor lighting. As far as technology is concerned, they are also still in an early stage; many developments and improvements are expected over the next decades, and a focus on the effects of the spectral quality of their light should play a large part in leading that developmental effort. Most of the high brightness "white" LEDs currently in development are actually blue LEDs, with a peak emission at about 460 nm. A phosphor compound is placed on top of the emitter; this compound absorbs some of the blue light, and re-emits it at longer wavelengths, usually peaking in the yellow range. The first spectral power distribution graph (top left) is of a white LED with a correlated color temperature (CCT) of 6650°K; the amount of the original blue light passing out through the phosphor coating is high13. The light from this LED has a strong blue "cold" cast; many would perceive it as "harsh". The lower SPD graph is of a white LED with a CCT of 2875°K; a "warm white" appearance, more like an incandescent lamp. A heavier coating of phosphors has been applied to this LED, absorbing more of the original blue output, and emitting a higher percentage of light from the yellow phosphors than directly from the LED. This "Stokes shift" of light from the blue to the longer wavelengths is not perfectly efficient; some energy is lost in the process. So, the bluer LED has a somewhat higher energy efficiency, although this technology is steadily improving. And because of how these LEDs work, even though the "warmer" appearing one has notably less blue output than the 6650°K one, it puts out far more deep blue light than an actual 2875°K incandescent lamp would (repeating our earlier warning that CCT is not an accurate way of analyzing spectral output). The colors of light created by our artificial light sources play a large part in determining both the quality of illumination they provide, and the levels of undesirable environmental impacts which they create. Much more research needs to be done to investigate and quantify how different wavelengths of light interact with our environment, but we do already have a substantial amount of data. It seems clear that many negative, unintended effects are notably increased in shorter, bluer wavelengths of light. As a society, we need to become aware that "light isn't just light"; analysis of the spectral nature of the light which we create, and fill our nocturnal world with, is critically important. Both current lighting practice and future advances, including LED technology, need to be driven by work in spectral analysis. 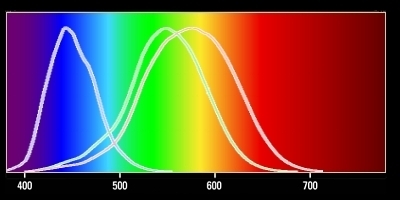 The lighting industry's focus up until now, on human perception issues of Correlated Color Temperature and Color Rendering Index, is not structured to deal with important spectral effects. Light with wavelengths shorter than 500 nanometers seems clearly to pose problems in human visual perception and health, and in other areas, including skyglow. Health effects related to exposure to manmade light at night will probably turn out to be strongly influenced by indoor lighting, but it is a mistake to ignore our exposure from outdoor illumination, which pervades our nocturnal environments more each year. In nearly all situations where artificial lighting is used outdoors, human vision is influenced by both rod and cone spectral sensitivities. 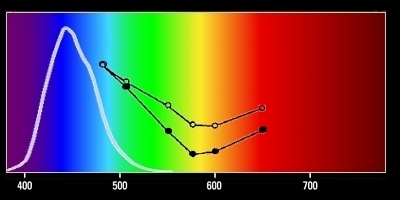 Since both of these cell groups are most sensitive to light that is longer than 500 nm, we can optimize lighting color for vision at night but still reduce the amount of potentially disruptive light emitted below 500 nm. This, indeed, should be a major driving goal in the development of better light sources. And there will be instances where moderately high (photopic) illumination is needed, but we don't need precise color rendition; in those cases we'll probably be better off using light sources which have very little output in wavelengths shorter than our peak sensitivity in the yellow-green. But longer wavelengths of light, even into the infrared, can also create environmental disruption when dumped into nocturnal environments. It is likely we will never know which wavelengths are most disruptive to each of the hundreds of thousands of species of organisms we share this planet with. The only prudent solution for minimizing the total negative effects our artificial lighting has on the environment is to re-think how we apply light at night, and adopt the practice of only applying the minimal levels needed, focused only on the areas where we have tasks to accomplish, only at the times we are active there. Only that practice can minimize all the unintended negative effects of manmade light at night. But where we do need to apply light, color matters.